Appropriate for Grades 4-9 The Dip-er-do II Boomerang Stunt Plane is the perfect tool for teaching flight! Everyone can can make it to do loops, circles, and land back in their hand. 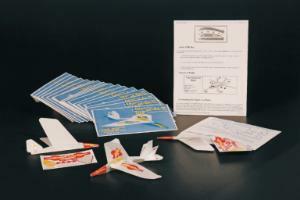 Museums, camps, and even an educational specialist at NASA have used the Dip-er-do. Simple adjustments to the wing tips and tail flaps let you perform amazing indoor air stunts and maneuvers with the Dip-er-do.